THIS BLOG IS DEDICATED TO THE BELOVED AUTHOR JANE AUSTEN AND HER FANS IN SOUTH TEXAS. IT INCLUDES JANE AUSTEN RELATED EVENTS, BOOK AND FILM REVIEWS, RECIPES, AND MORE. The Lizzie Bennet Diaries DVD…and More! This is the UK seller of the new Pride & Prejudice Rose developed for 2013. On the website, if you click on New For 2013 you will find info on the rose. I had always been curious about the annual JASNA conventions, and the proximity of this meeting to my home town spurred me to attend. It was fortunate that I did, as it was an unmitigated delight! The convention focused on “Sense and Sensibility” (due to this being the 200th anniversary of its publication) and all the plenary speakers and sessions were both interesting and inspiring. (Andrew Davies, prominent author and screenwriter, was a particular highlight, and we were fortunate enough to have Louise West, Curator of Jane Austen’s House Museum in Chawton, England with us as well.) The social gatherings were also exemplary; the banquet, Regency ball, and wedding brunch were beautifully done and allowed us to mingle with a myriad of other wonderful attendees (many of whom were in beautiful costumes). I went with friends, but didn’t meet a stranger the entire time! Kudos to the special tours as well; I went to the Botanical gardens (which included a spectacular Japanese garden), but other tour options included a special tea, museums, and more. I highly recommend the JASNA convention to any Austen fan; there’s something for everyone, ranging from her most casual readers to academics. Janeites, unite! Disclosure: I am not a fan of chick-lit. Also not a fan of Jane Austen sequels or fanfiction, in general. In fact, I probably shouldn’t be reviewing this at all, since I began reading this with prejudice. (But no pride). I used to read chick lit until I figured out that most of it is a waste of time. Clever, witty novels about young singletons in the big city are few and far between. Curse you, Helen Fielding, for actually writing a good Jane Austen knockoff! She has inspired multitudes of mediocrity after the success of Bridget Jones’s Diary. Which she couldn’t even duplicate herself, unfortunately. Anyway, in a moment of weakness, I decided to make an exception after seeing this book amongst the multitudes of JA-inspired fiction at the recent JASNA meeting in Philadelphia (though I was not inspired to spend hard cash on it; I held out and got it from the library). Nevertheless, after seeing the melodromatic cover art and snarky title, I was hoping for something witty. But this was not to be. 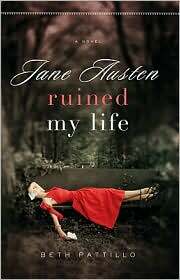 Basically, it’s pretty standard chick lit with a Jane Austen connection, albeit one that is somewhat academic in nature, since the writer is trying to include some actual facts about JA’s life. The setup: Emma (of course! There’s an Austen connection right there! Well, at least she isn’t named Jane or Elizabeth), a thirtysomething career women, has fled from Texas to London after her nasty ex-husband and his mistress have ruined her academic career at a prestigious university. Conveniently, Emma has a cousin — half-French, so she is tres-cool — has a charming townhouse which is conveniently empty at the moment. Well, except for the convenient presence of her former male BFF friend from grad school, who is alsostaying there; is conveniently hot, and, naturally — who was madly in love with her until she married their Casanova-esque professor. Conveniently! Anyway, Emma is trying to resolve her hurt pride and simultaneously resurrect her flagging career as a JA scholar by finding some priceless, super-secret Jane Austen letters, never before seen by the public. Awesome! Seems there is a mysterious eccentric Englishwoman who has (conveniently) decided Emma is potentially worthy of this enormous coup. She is sent on mini-quests all over England, following in Jane Austen’s historic footsteps. She’s also forced to make Big Decisions about her own career path, relationships with her family, and possible love with said hottie. Although this book includes mildly entertaining theories about Jane Austen’s missing letters and lost loves, the only thing I really liked about it was that it includes background about Jane Austen’s life, which most fans could easily pick up in any decently written biography (I’m still working on that; hopefully some reviews will follow in the near future). Emma’s pretty whiny and self-absorbed (but hey, so is Jane Austen’s Emma! ), but overall I found too many plot holes, too many contrivances, at least one major mistake — she’s supposed be an Austen scholar and there’s a huge error about Mansfield Park! Not to mention the lack of well-developed characters, other than our heroine. It’s a pretty easy read, and if you like chick lit and Jane Austen, this might be the book for you. Just not the book for me. I should really just stick with the real thing. Oh, Emma. How I love you, and yet, how you frustrate and annoy me. Even Jane Austen wrote that she had created a heroine “whom no one but myself will much like.” So there you have it. 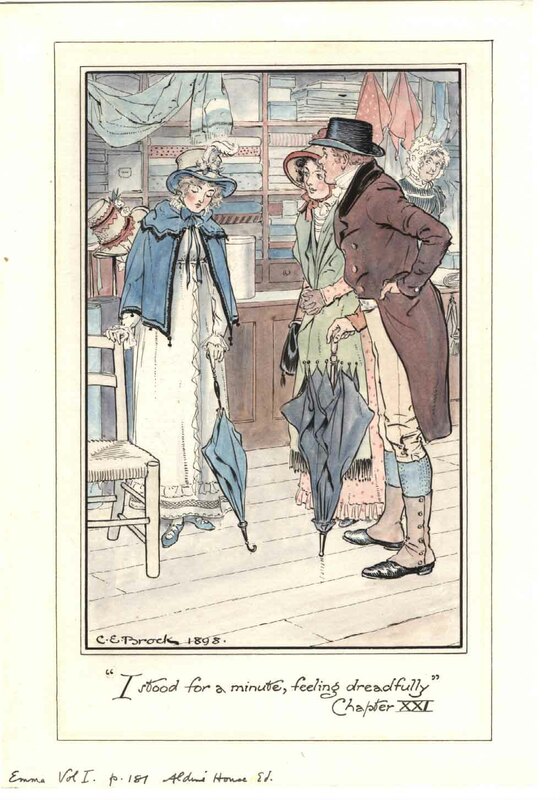 Emma Woodhouse is unique among Jane Austen’s heroines because she’s rich and doesn’t need to worry about finding herself a good husband. However, this means that she’s got lots of time on her hands, so she’s basically a busybody and decides to match up all of her unmarried friends. Unfortunately, she’s also an insufferable snob, and thinks she knows who’s best for everyone. This eventually backfires when she realizes she may have messed up her own chances with the one man she really loves. In true Austen fashion, all ends well, though not exactly as first expected. The first time I read this, I was so frustrated by Emma’s character that I wanted to throw the book across the room (heretical behavior for a bibliophile!). But this is just proof that Emma is so believeable and her character is so well-developed. 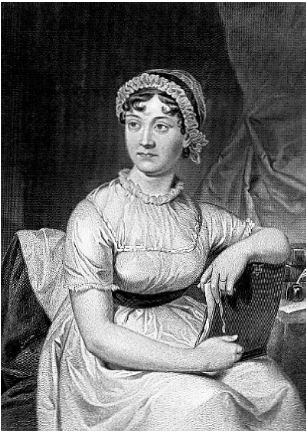 Jane Austen makes her come to life. And the other characters, such as the chatterbox Miss Bates and the obnoxious Mrs. Elton, are so real I wanted to yell at them too. However, I will say that Emma, likeDavid Copperfield, could have used a little editing. Some of the passages just seem to go on and on. That’s probably why it’s Jane Austen’s longest book. This time around I actually read very little of the print version, and mostly listened to the excellent audiobook narrated by Juliet Stevenson (on Naxos Audiobooks). If you’ve seen the 1996 film adaptation starring Gwyneth Paltrow, you might remember that Stevenson played the obnoxious and insufferable Mrs. Elton. This audiobook is absolutely wonderful and her narration is spot-on, making all the characters distinct. I even forgot that it was a woman narrating the men’s parts as well, which I think is one sign of great audiobook narrator. If it wasn’t so darned expensive I’d buy my own copy, but it’s more than $80 plus shipping for the set of 13 CDs and $45 for the digital download. Still, if you can get it from your library, it’s worth a listen. Some people think that listening to an audiobook is somehow cheating — The New York Times published a really interestingarticle on this very subject. Personally, I don’t think so, as long as it’s an unabridged version — it’s not as if you’re reading the Cliffs Notes. I think the audio forces me to slow down and pay more attention — sometimes I get so caught up in the plot of a book that I rush through to find out what’s going to happen next. Also, some readers like Ms. Stevenson are so talented, they bring all the characters and situations to life, which makes it so much more memorable and enjoyable; but of course, some narrators can potentially ruin a book altogether. Also, didn’t the oral tradition of storytelling precede written narration? It’s an ancient tradition. I don’t think it’s “cheating” the same way that watching a movie adaptation is. And I am a pushover for an Austen adaptation. I think I’ve seen them all, several times. I’m just waiting for the newest Emma adaptation, coming to PBS in January. I’ll be sure and post my thoughts on that as well. Note: A version of this review originally appeared on my other blog, Karensbooksandchocolate.blogspot.com. 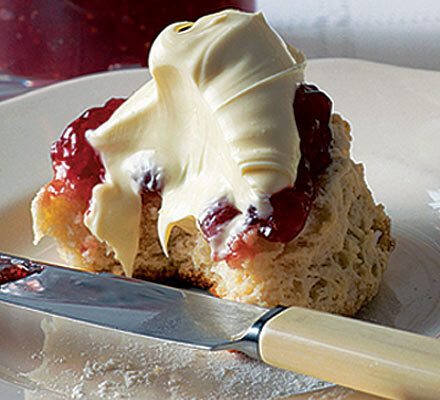 Poor Jane Austen never ate scones. Sadly, baking powder wasn’t invented until about 1859, years after her death. (see The Food Timeline for more information. A great website, I have spent hours surfing there). But I’m pretty sure they did eat biscuits, which are somewhat related. And I am convinced that, had baking powder been invented 50 years earlier, Jane Austen, and her heroines, would absolutely have eaten lots of scones, so make a cup of Earl Grey and eat them while you read (or watch) the works of Jane Austen, with pleasure. Additional 1 egg, for glazing, and additional white sugar for topping. 1. Preheat oven to 425 degrees — if your oven runs hot like mine, adjust it back to 400. 3. Cut the butter into small pieces and add them to the flour mixture. Using a pastry blender, or two butter knives, keep cutting the butter into smaller and smaller pieces, while coating with the flour, until it looks like wet sand. If you want to add currents or other mix-ins, now is the time. I’m not fond of raisins and such but dried cranberries are nice (also nice if you add a little grated orange rind). Chocolate chunks are decadent, and not traditional, but wonderful. I’ve also eaten wonderful scones with chopped fresh rosemary. It sounds odd but they were delicious (not with jam, of course). 4. Beat the egg, add it to the dry ingredients and add most of the milk — hold a little bit back, just in case. Gently mix the wet ingredients into the dry ingredients, until a soft dough is formed — don’t let it get too sticky. Knead it about 15 times until it holds together, and is smooth, but be gentle since overworking the dough makes it tough. 5. Sprinkle some flour on your work surface, and divide the dough into two balls. Flatten each ball into a 1/2 inch circle and cut into 8 wedges, like a pie. Place them on a baking sheet lined with parchment, brush them with the extra beaten egg, and sprinkle with sugar. 6. Bake until golden brown, about 12 minutes. These are delicious served plain or with your favorite jam. Devonshire cream is traditional, but hard to come by here in the states, and rather expensive. Whipped cream or butter are also nice — if y0u can find Kerrygold Irish butter, it is worth every penny. Or my favorite, lemon curd, a delicious lemony custard similar to pie filling. Note: this recipe was previously posted on my book review blog,Books and Chocolate. The Jane Austen Book Group is meeting Saturday, November 14 at 11 a.m. at theSemmes branch of the San Antonio Public Library, 15060 Judson Rd., San Antonio, TX. We’ll be watching Clueless, a modern adaptation of Jane Austen’s Emma. Potluck refreshments will be served. This event is open to the public — we hope to see you there! Welcome to the new blog for Jane Austen fans in San Antonio, Texas! I am a longtime fan of the works of Jane Austen, and a new member of the Jane Austen Society of North America. I’m neither an expert nor an academic, just an “amatuer” fan. On this blog I hope to inform and update other Janeites about any activities in the San Antonio area, plus I’ll include book and film reviews, recipes, and all sorts of great links. I welcome comments, suggestions, and contributions. Enjoy!